For those who buy personally at our Garden Centre shop we sell most of the seed potatoes varieites loose enabling the customer to purchase the exact quantity needed at a very good price. For items sold loose we have 25Kg sacks available, please contact us for prices and availability. We recommend that you buy seed potatoes in January or February. The best size to buy is between 1 to 2 oz. However, the yield is not greatly affected by the size of potato planted, and all sizes offered by us, including the smallest, will give good results. If you buy the potatoes before the recommended planting time, set them out in trays (containing 1 inch / 2.5cm of dry peat if preferred) with the end of the potato with most eyes at the top, and keep in a cool, light, frost-free position until it is time to plant. Alternatively you can buy potatoes at planting time and plant them straight away (after knocking off any long white shoots) but this will reduce the yield and give a later crop, especially for earlies. EARLIES from late March, 12 inches (30cm) between potatoes, 24 inches (60cm) between rows and 5 inches (13cm) deep. MAINCROP from Mid-April, 15 inches (38cm) between potatoes, 30 inches (76cm) between rows and 5 inches (13cm) deep. Cover with soil and make a low ridge. Protect shoots from frost if necessary by covering with a protective material such as dry straw. When plant is approximately 6 inches (15cm) high, draw loose soil up against stems to approximately 5 inches (13cm) high. Increase the height of the ridge by a further inch or two (3-5cm) when the plant has grown sufficiently. Water in dry weather. When flowers are fully open, examine potatoes. They will be ready when they are the size of a hen's eggs. 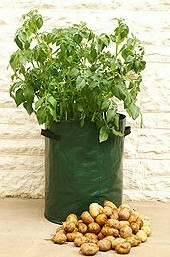 To lift, insert fork well away from plant and ensure all tubers are lifted from soil. Cut off foliage when it has turned brown and wait 10 days, then lift as above. To store, leave to dry for a few hours and place in boxes or bags in a dark frost free room. © Buckingham Nurseries and Garden Centre, all rights reserved.